We’ve all been waiting for it, Card Jitsu Water has been released and it’s been released a day early. 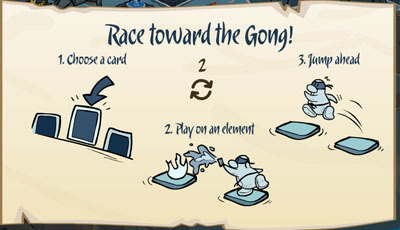 Here’s complete Ultimate Guide To Card Jitsu Water. Below is a complete video of Card Jitsu Water. If you would like to know to play Card Jitsu water, go down to the bottom of the post. 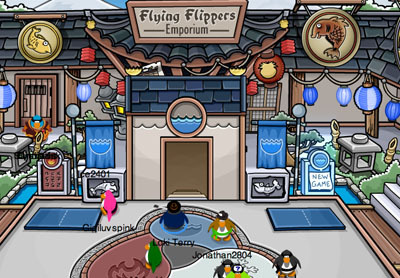 There’s a brand new Dojo Courtyard, decorated for the opening of Card-Jitsu Water. When you are inside the Ninja Hideout, there is a new entrance. This one takes you to the Waterfall to play Card-Jitsu Water. Go to the Water Dojo. After he gives you the deck set, you are ready to play Card-Jitsu Water. One the tiles, there is one of three elements – water, fire, and ice. If there is water on the tile, you would need to play ice to make it “cancel out” so you can move forward. What you want to do is be the last one standing on the tiles, without falling over the edge of the waterfall. The longer you stay in the game, the quicker you level up. Near the end, you will become a Water Ninja. Here’s a picture of the water ninja costume, thanks to Uncle Fun. I love the Card Jitsu water game more than the Card Jitsu Fire, do you?! – It’s so cool and fun! Ahoy penguins!! I will be on Club Penguin on the 7th of December at 5pm. I will be in Fog in the Gift Shop. Be there for plenty of free gifts!! Visit http://play.clubpenguin.com to sign up or sign in!! 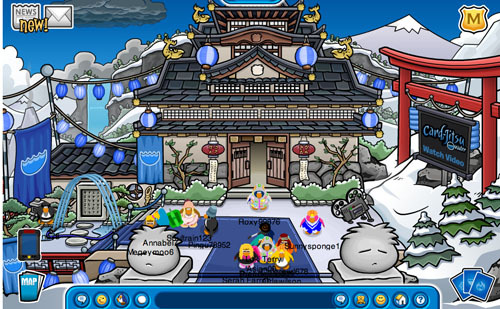 Waddle around and meet new friends with Club Penguin!! Also, I hope you know that there is a new design for the newspaper! It saves paper and helps the ClubPenguin Staff! Enjoy! Woahhh really??? Rockhopper will be there??!!?! I love him and i’m going! !